Would Prolotherapy Work For Me? 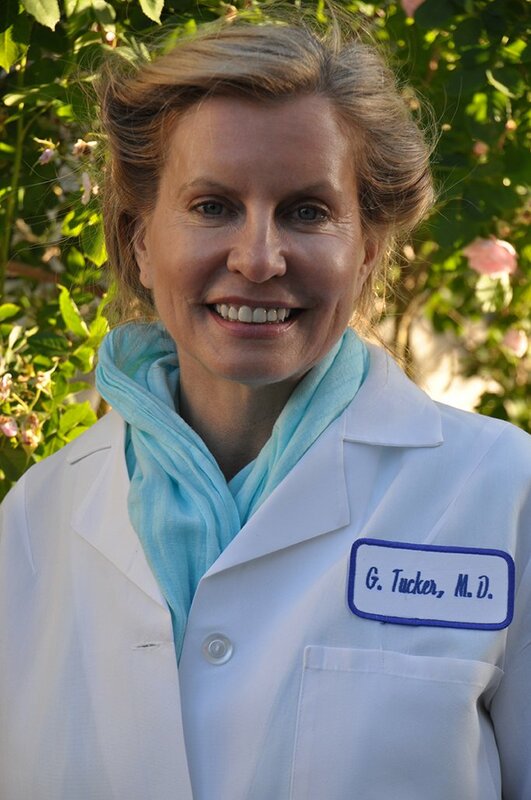 Gloria Tucker, M.D., a Phi Beta Kappa from USC, Board Certified in Sports Medicine, practiced traditional non-surgical orthopedics for 13 years. Once she experienced dramatic results with Prolotherapy, she changed her entire focus to Prolotherapy and after mastering it, she became an instructor of Proliferative Medicine to other physicians, and has been teaching for many years. She is also a published author in the field of proliferative/regenerative medicine. Seeing the limitations of traditional medicine, she studied and became proficient at advanced techniques for patients who did not respond to usual care or preferred alternative therapies. Her advanced techniques include: PRP, Dextrose Prolotherapy, and Peri-Neural Injection Therapy. This opened new horizons for her and she took courses in Osteopathy, Functional Movement Assessment Techniques, Ozone Therapy, and Stem Cell Treatment. And although, she does not practice these modalities, she is knowledgeable and able to carefully assess her patients and refer, when appropriate. In addition, she is well connected to alternative providers. These include: Chiropractic Care, Orthopedic Massage, Neuro-Kinetic Therapy, Acupuncture, Myo-fascial and Energy work. As a classically trained MD, she refers her patients to orthopedic surgeons and physical therapists when indicated. She is committed to evaluating her patient’s pain properly and recommending the right treatment. to make an accurate diagnosis. Dr. Tucker’s treatments get to the source of your pain and take care of it once and for all. Her treatments are not invasive, like surgery. They don’t mask the pain, like drug therapy. Instead, her treatments literally help your own body rebuild the supporting structures around the painful joint – giving you enduring pain relief. Dr. Tucker’s diagnoses and treatments are at the cutting edge of medicine today. Millions of people in this country suffer from pain in their backs, knees, neck, feet, and every joint imaginable. Pain has severely limited their lives. More times than not, people are unsure about the cause of this pain and have found no relief. Perhaps this is you. Pain medicines are prescribed. Sometimes surgery is recommended, but the pain continues. Frequently, after an injury or surgery, very specific tendons or ligaments are damaged and they are unable to heal on their own. Exercise won’t strengthen a damaged ligament. And the pain persists. Dr. Tucker weaves together the Analytic Expertise of Traditional Medicine with the Time-Honored Success of Alternative Knowledge. of PRP, Prolotherapy and Peri-Neural Injection Therapy. What is Proliferative Medicine (Regenerative Medicine or Prolotherapy)? Proliferative treatment involves carefully addressing each tendon and ligament surrounding the injured joint. We create a very precise inflammatory response in the injured tissue allowing collagen to reform and healing to occur. 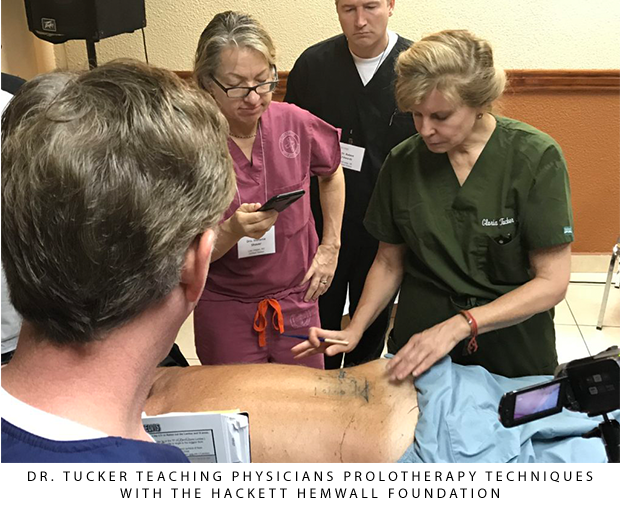 Guided by Ultra Sound, a series of very specific small injections initiates this response, and effectively tightens and heals the damaged tissue. Once these structures are stable, pain resolves and strengthening can take place. Proliferative Medicine is the treatment of choice for the loose-jointed patient (Hypermobile), patellar subluxation, recurrent ankle sprain, sacro-iliac (SI) instability, low back pain, mid back pain, hip, knee (especially meniscal injuries), plantar fasciitis, fallen arches, tennis elbow, golfer’s elbow and most problems in the foot, hand, wrist, elbow, shoulder, back and neck. It is a great remedy for early arthritis and sports injuries. Other disorders that respond beautifully to Proliferative treatment include Lyme Disease, Fibromyalgia (which is frequently associated with hypermobility) Rheumatoid Arthritis, Ehlors-Danlos syndrome and so much more. Can proliferative medicine help with my nerve pain? Yes! This is a breakthrough procedure that has been recently pioneered by Dr. John Lyftgot . He found that the receptors (TRPV1) to the chemicals secreted by the nerves carry the sensitivity to pain. When those nerves have been ignited, he found that injecting the skin along the nerve tracts shut down the pain transmission. We use 5% dextrose which diffuses down into the deeper nerve tracts and stops the pain. This technique works, and it is very safe. I have had great success with this in facial pain, neck pain, head pain, hip pain, peripheral nerve pain and severe nerve pain after injury and surgery.